Home >Blogs > Brushy Brush Your Teeth with Elmo! Brushy Brush Your Teeth with Elmo! 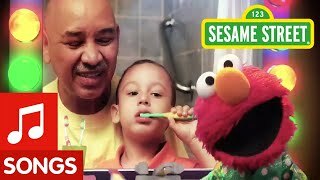 We know that this Sesame Street PSA about brushing teeth is meant for children, but we just couldn’t resist posting it on the blog! Share with your friends and family and start singing the Brushy Brush song! Teaching Kids Healthy Oral Hygiene It’s important to teach kids how to properly brush their teeth. By using the Brushy Brush song and other oral hygiene teaching techniques, kids will soon make brushing their teeth, flossing, and using mouthwash everyday habits – decreasing their chances of developing cavities, gum disease and other dental issues. Need help teaching your kids the importance of healthy oral hygiene? Speak with one of our Sunrise Dental dentists to learn new techniques and tricks! Schedule a Dental Appointment Sunrise Dental is a family dental practice with 3 locations in the Raleigh-Durham, NC area. We pride ourselves on providing quality and state of the art care to every patient, no matter how small. Schedule your next dental appointment by calling one of our offices in Raleigh, Durham or Chapel Hill or schedule your appointment online!